ethe Moyamoya Center, Division of Neurosurgery, Department of Surgery (N.K. ), University Children's Hospital Zurich, Zurich, Switzerland. BACKGROUND AND PURPOSE: Cerebral perfusion assessment is important in the preoperative evaluation and postoperative follow-up of patients with Moyamoya disease. The objective of this study was to evaluate the correlation of quantitative CBF measurements performed with arterial spin-labeling–MR imaging and H2[15O]-PET in children and young adults with Moyamoya disease. MATERIALS AND METHODS: Thirteen children and young adults (8 female patients; age, 9.7 ± 7.1 years; range, 1–23 years) with Moyamoya disease underwent cerebral perfusion imaging with H2[15O]-PET (Discovery STE PET/CT, 3D Fourier rebinning filtered back-projection, 128 × 128 × 47 matrix, 2.34 × 2.34 × 3.27 mm3 voxel spacing) and arterial spin-labeling (3T scanner, 3D pulsed continuous arterial spin-labeling sequence, 32 axial sections, TR = 5.5 seconds, TE = 25 ms, FOV = 24 cm, 128 × 128 matrix, 1.875 × 1.875 × 5 mm3 voxel spacing) within less than 2 weeks of each other. Perfusion of left and right anterior cerebral artery, MCA, and posterior cerebral artery territories was qualitatively assessed for arterial spin-labeling–MR imaging and H2[15O]-PET by 2 independent readers by use of a 3-point-Likert scale. Quantitative correlation of relative CBF with cerebellar normalization between arterial spin-labeling–MR imaging and H2[15O]-PET was evaluated in a volume-based approach for each vascular territory after 3D image coregistration. RESULTS: Interreader agreement was good (κ = 0.67–0.69), and strong and significant correlations were found between arterial spin-labeling–MR imaging and H2[15O]-PET for both qualitative perfusion scoring (ρ = 0.77; P < .001) and quantitative perfusion assessment of relative CBF with cerebellar normalization (r = 0.67, P < .001). CONCLUSIONS: In children and young adults with Moyamoya disease, quantitative evaluation of CBF is possible with the use of arterial spin-labeling–MR imaging without ionizing radiation or contrast injection with a good correlation to H2[15O]-PET after cerebellar normalization. Children and young adults with Moyamoya disease have progressive bilateral stenosis of the supraclinoid ICA, anterior cerebral artery, MCA, and to a much lesser extent, the posterior cerebral artery, with formation of netlike collateral vessel networks, termed “Moyamoya” vessels.1 “Moyamoya” is the Japanese term for “puff of smoke” and describes the characteristic angiographic appearance of the collateral vessel networks typically formed at the skull base and around the basal ganglia in Moyamoya disease. The condition is rare; however, it is implicated in approximately 6% of childhood strokes.2 The main goal of treatment of children with Moyamoya is the prevention of future strokes by means of surgical revascularization. As a method requiring neither ionizing radiation nor exogenous contrast material injection, ASL could represent an ideal technique for the assessment of cerebral perfusion in children. The purpose of the present study was thus to assess the comparability of ASL and the reference standard of H2[15O]-PET imaging in children and young adults with Moyamoya disease. Children and young adults with angiographically proven Moyamoya disease who underwent both MR imaging with ASL imaging as well as H2[15O]-PET for preoperative assessment or postoperative follow-up after surgical revascularization as a routine work-up at our institutions between January 2011 and December 2012 were included in this retrospective study. The informed consent requirement was waived by the institutional review board because of the retrospective nature of the study. Exclusion criteria were patient age >25 years (n = 0), H2[15O]-PET not performed within 2 weeks of ASL (n = 11), interventions or cerebrovascular incidents (ie, transient ischemic attacks or strokes) between the 2 examinations (n = 0), postoperative status <6 months (n = 0), contraindications to sedation in children <6 years old as evaluated by a board-certified anesthesiologist (n = 0), contraindications to contrast-enhanced MR imaging, such as noncompatible metallic implants or known previous allergic reactions to gadolinium-based contrast material (n = 0), and nondiagnostic image quality of either ASL or H2[15O]-PET studies (n = 1: nondiagnostic image quality of ASL caused by motion artifacts). Thirteen children and young adults (8 female patients and 5 male patients; age, 9.7 ± 7.1 years; range, 1–23 years) met all criteria and were thus included in the study. Suzuki stages of the angiographically confirmed Moyamoya disease in these patients were II (n = 4), III (n = 4), IV (n = 3), and V (n = 2). Anterior watershed infarctions were present in 4 patients unilaterally and in 1 patient bilaterally. The mean time interval between the 2 examinations was 2 ± 3 days (range, 1–13 days). H2[15O]-PET was performed first in 3 patients, whereas ASL was performed first in 10 patients. Because of the retrospective nature of the study, the order of acquisition was not randomized. MR imaging was performed with the use of a 3T scanner (HD.xt TwinSpeed; GE Healthcare, Milwaukee, Wisconsin) equipped with an 8-channel receive-only head coil for signal reception in all patients. Patients under the age of 6 years (n = 6), were sedated with propofol (Propofol-Lipuro; Braun Medical, Melsungen, Germany) and monitored by a board-certified anesthesiologist during the examination. A standardized MR imaging protocol for patients with Moyamoya disease consisting of multiplanar T2WI, T1WI, FLAIR, DWI, 3D-TOF, ASL, and contrast-enhanced DSC as well as multiplanar postcontrast T1WI was performed in all patients without complications. ASL images were acquired as 32 axial sections by use of a background-suppressed, pulsed continuous arterial spin-labeling sequence, with a 3D stack of spiral fast spin-echo readout.10 The labeling duration was 1.5 seconds, and a postlabeling delay of 1.5 seconds was used to reduce errors from transit time effects.11 Further imaging parameters of the ASL sequence were TR, 5500 ms; TE, 25 ms; FOV, 24 cm; matrix, 128 × 128; section thickness, 5 mm; and number of excitations, 3. The reconstructed voxel spacing was 1.875 × 1.875 × 5 mm3. The total scan time was 5 minutes, 34 seconds. In this equation, f is blood flow (in mL/min per 100 mg), Sctrl-Slbl is the difference image (control-label), and Sref is a proton-attenuation–weighted reference image; λ is the blood-brain partition coefficient (0.9), α is the inversion efficiency, T1b is the T1 of blood (1600 ms), T1g is the T1 of gray matter (1200 ms), w is the postlabeling delay (1.5 seconds), and τ is the labeling duration (1.5 seconds).9,12,13 To investigate the effects of variations in blood T1 across the patient group, the blood T1 was calculated for n = 11 patients from venous hematocrit levels according to the equation T1 = 1/(0.83 Hct + 0.28). ASL perfusion values were calculated by use of an assumed blood T1 of 1600 ms and by use of the individual blood T1 for the patients in whom hematocrit data were available. The PET data were acquired in 3D mode on a full-ring PET/CT scanner (Discovery STE; GE Healthcare) and corrected for attenuation, scatter, random photons, and dead time by use of the corresponding low-dose CT (120 kV/80 mA). The scanner's axial FOV covered 15.3 cm, and transaxial images were reconstructed by use of a 3D Fourier rebinning filtered back-projection algorithm resulting in a 128 × 128 × 47 matrix with 2.34 × 2.34 × 3.27 mm3 voxel spacing; 400–800 MBq H2[15O] was administered intravenously by use of an automatic injection device that delivered the predefined tracer dose over a period of 20 seconds. Patients under the age of 6 years (n = 6, the same as in ASL) were sedated with the use of Propofol-Lipuro and monitored by a board-certified anesthesiologist during the examination. The emission data were acquired as a series of eighteen, 10-second frames. ASL and H2[15O]-PET CBF maps were assessed separately by 2 blinded and independent radiologists with 5 years and 7 years of experience. CBF was visually categorized on a 3-point Likert scale (1: normal, 2: reduced, 3: severely reduced) in the color-coded CBF maps (Fig 1) of each technique for anterior cerebral artery, MCA, and posterior cerebral artery territories on each side by comparison to cerebellar perfusion, which was assumed to be normal. 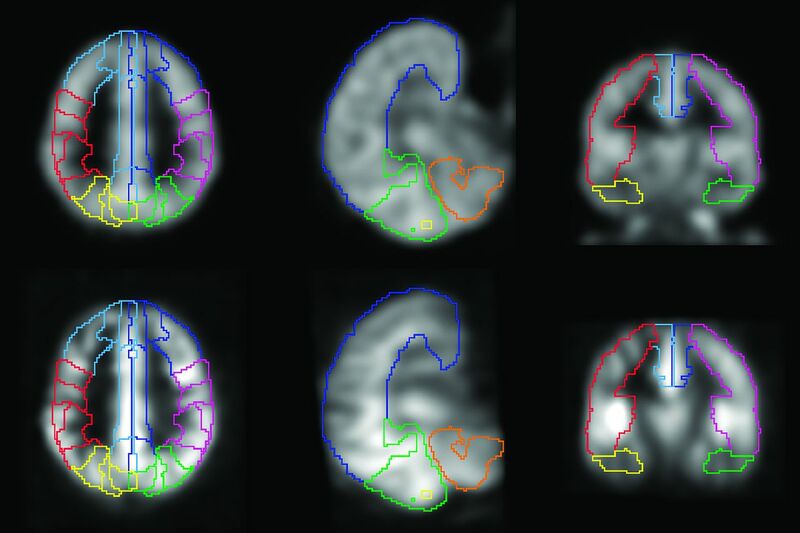 Example of CBF maps from H2[15O]-PET (upper row) and ASL (lower row) in the same 2-year-old girl with Moyamoya disease show reduced perfusion in the bilateral anterior and middle cerebral artery territories, more pronounced on the left (score 3) than on the right (score 2). Semi-automated image analysis was performed in PMOD (version 3.4; PMOD Technologies, Zurich, Switzerland). 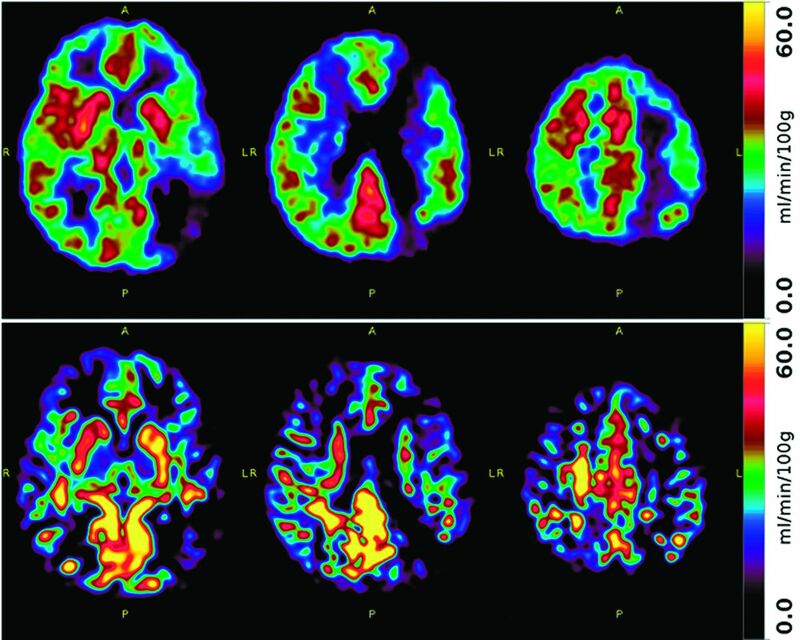 With the use of a PET perfusion template image (SPM5, average H2[15O] image from 12 subjects), ASL and PET perfusion maps were normalized to the stereotaxic spatial array of the Montreal Neurological Institute brain template by applying a mutual information–based registration including 12-parameter affine and elastic transformations and transitional image smoothing with a 6-mm full width at half maximum Gaussian kernel. Successful normalization was verified visually with the aid of image-outlining contours. After normalization, a volume-of-interest template defining the vascular territories (left/right, anterior cerebral artery, MCA, and posterior cerebral artery) and cerebellum was used to extract average perfusion by territory. This volume-of-interest template was generated by attributing the predefined brain regions outlined by the Hammer N30R83 atlas16 to the respective vascular territories and was identical in size and shape for both H2[15O]-PET and ASL data (Fig 2). Relative CBF values (rCBF), that is, cerebellar normalized values, were calculated by dividing the CBF value of the respective supratentorial territory by cerebellar CBF. Volume-of-interest definition for quantitative CBF assessment per territory (upper row: H2[15O]-PET; lower row: arterial spin-labeling). Cohen κ statistics were used for the assessment of interreader agreement in the evaluation of qualitative cerebral perfusion. Kappa values were interpreted as follows: κ ≥ 0.81, excellent; κ = 0.61–0.80, good; κ = 0.41–0.60, moderate; κ = 0.21–0.40, fair; and κ ≤ 0.20, poor agreement. The correlation between H2[15O]-PET and ASL was assessed by use of Spearman rank correlation coefficient for qualitative perfusion scores and by Pearson correlation coefficient for quantitative CBF values and quantitative relative CBF values after cerebellar normalization. Bland-Altman analysis was used to compare mean differences in CBF and rCBF between H2[15O]-PET and ASL. Paired t tests were used to compare CBF and rCBF values between H2[15O]-PET and ASL, and unpaired t tests were used to compare CBF and rCBF between territories with normal (qualitative perfusion score of 1) and reduced perfusion (score of 2 or 3) for both H2[15O]-PET and ASL. 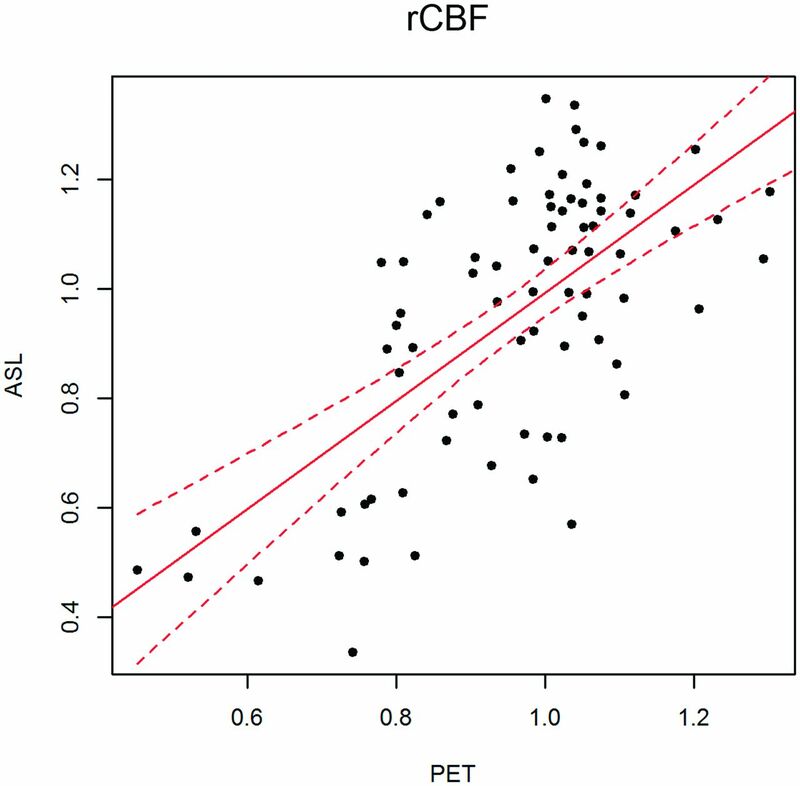 Differences in CBF and rCBF between territories grouped by perfusion scores were assessed by means of 1-way ANOVA with Tukey honestly significant differences post hoc analysis. All statistical tests were performed with the use of the statistical package R17 (http://www.r-project.org/) and the R frontend RKWard Version 0.6.1 (http://rkward.sourceforge.net/). Statistical significance was inferred at P < .05. Interreader agreement for qualitative perfusion assessment was good for both H2[15O]-PET (κ = 0.67) and ASL (κ = 0.69). A strong and significant correlation between perfusion scores in ASL and H2[15O]-PET was found (ρ = 0.77; P < .001). No posterior circulation involvement that could have influenced cerebellar normalization was found in our patient cohort. Reduced perfusion in the visual qualitative assessment was found in 33 of 78 (42%) territories in 11 of 13 (85%) patients with H2[15O]-PET and in 32 of 78 (41%) territories in the same 11 of 13 (85%) patients with ASL. An overview of the qualitative perfusion assessment per vascular territory in both H2[15O]-PET and ASL is provided in the Table. Quantitative image analysis revealed a strong and significant correlation between H2[15O]-PET and ASL (r = 0.67, P < .001) after cerebellar normalization (rCBF), with a regression slope of 1.0061 and intercept of −0.0057 (Fig 3). For absolute CBF values, the correlation was much weaker (r = 0.26, P = .015) using a literature value (1600 ms) for the blood T1 in the ASL perfusion quantification. The correlation was not improved with the use of an individual blood T1 on the basis of the hematocrit (r = 0.14, P = .025). Correlation of relative CBF after cerebellar normalization (rCBF) between H2[15O]-PET and arterial spin-labeling (r = 0.67, P < .001). Linear regression fit line is shown in red (dashed lines show 95% confidence limits). Mean CBF values (across all perfusion territories) were 30.58 ± 7.56 mL/min per 100 g in H2[15O]-PET and 28.38 ± 9.15 mL/min per 100 g in ASL. Bland-Altman analysis showed a mean difference of 2.19 ± 10.23 mL/min per 100 g between H2[15O]-PET and ASL (P = .062). After cerebellar normalization, mean rCBF values (all territories) were 0.958 ± 0.165 for H2[15O]-PET and 0.951 ± 0.247 for ASL, with a mean difference of 0.007 ± 0.186 (P = .737) (Fig 4). Bland-Altman plots of CBF (mL/100 g per minute) and relative CBF after cerebellar normalization (rCBF). Territories with normal qualitative perfusion (score 1) showed similar values in H2[15O]-PET and ASL (P = .497). Similar values were also found for territories with reduced perfusion (score 2) in H2[15O]-PET and ASL (P = .162). For territories with severely reduced perfusion (score 3), values tended to be higher in H2[15O]-PET (CBF: 23.00 ± 3.70 mL/min per 100 g; rCBF: 0.677 ± 0.161) than in ASL (CBF: 16.06 ± 5.18 mL/min per 100 g; rCBF: 0.507 ± 0.098), though not at a statistically significant level (P = .085). An overview of all quantitative perfusion values is provided in the Table. Quantitative perfusion values were significantly lower in territories with reduced qualitative perfusion scores (ie, scores 2 and 3) compared with those with normal qualitative perfusion for both H2[15O]-PET (CBF: P = .025, rCBF: P = .016) and ASL (CBF: P = .010, rCBF: P = .004). Significant differences between territories with reduced perfusion (score 2) and severely reduced perfusion (score 3) were found for ASL (P = .03) but not for H2[15O]-PET (P = .17). In the present study, we compared MR imaging–based and PET-based methods for the evaluation of cerebral perfusion in children and young adults with Moyamoya disease, through the use of qualitative and quantitative approaches. Our results demonstrate that CBF assessment by use of ASL-MR imaging with cerebellar normalization correlates well with the reference standard H2[15O]-PET method. This suggests that ASL-MR imaging could be a valuable alternative to H2[15O]-PET, while avoiding the use of ionizing radiation and injection of an exogenous contrast agent. However, absolute values of CBF may differ between the modalities. Arterial spin-labeling is a well-established method for the quantitative assessment of cerebral perfusion. It does not require the injection of an exogenous contrast agent but instead uses the water in arterial blood as an endogenous tracer through electromagnetic tagging with radiofrequency pulses. For the calculation of blood flow, the amount of labeled blood arriving in the cerebral tissue after a predefined transit time is measured by subtraction from a previously acquired control image.19 A high correlation between ASL and DSC has been reported, with correlation coefficients between ASL and DSC of 0.62–0.79 in patients with acute ischemic stroke.20 In a recent study with the use of DSC as the standard of reference in children with Moyamoya disease, it could be demonstrated that ASL-based measurements of CBF showed a similarly strong and significant correlation with DSC-based perfusion (r = 0.79, P < .001), enabling the detection of impaired perfusion per cerebral vascular territory with a high diagnostic accuracy.9 In a direct comparison of ASL and H2[15O]-PET, one study found similar cortical perfusion values with no significant differences between the 2 modalities in 12 healthy subjects.21 However, to the best of our knowledge, there has been no study comparing cerebral perfusion imaging with ASL and the current reference standard of H2[15O]-PET in children and young adults with Moyamoya disease. Assessment of CBF with ASL imaging has been shown to correlate with (123I-IMP)-SPECT in patients with Moyamoya disease, though the absolute values of CBF were found to be slightly lower in ASL.22 Our results show a similar trend toward underestimation of CBF in ASL compared with H2[15O]-PET, particularly in territories with severely reduced perfusion in the qualitative visual assessment. This could be partly due to long transit times caused by the presence of collateral vessel networks feeding these territories, leading to a loss of perfusion signal in which the labeled blood does not arrive between the time of labeling and image acquisition, resulting in artificially low CBF values.23 However, because transit time errors would not be expected to affect the cerebellar perfusion in Moyamoya disease, the observation that cerebellar normalization improves the correlation between ASL and PET suggests that lengthened transit times are not the major source of the discrepancy in absolute perfusion values between the 2 modalities. Rather, our observation that cerebellar normalization improves the agreement between ASL and PET suggests that errors in global scaling factors (which would affect the cerebellum and cortical/subcortical regions equally) are likely to underlie the differences in absolute ASL and PET perfusion values. Because the reliability of ASL perfusion values is most affected by errors in the labeling efficiency, the equilibrium magnetization of blood and tissue, and the blood T1 used for perfusion scaling,24 errors in these factors may contribute to the difference in perfusion values measured between ASL and PET observed in the present study. However, accounting for differences in blood T1 did not improve the correlation between ASL and PET perfusion values in our study, suggesting that the discrepancy observed between the perfusion measurements from the 2 modalities without cerebellar normalization are likely to arise from other effects. Future studies should investigate if MR angiographic flow measurements can reduce these errors by correcting the labeling efficiency values used for quantification. Alternatively, the difference in ASL-derived and H2[15O]-PET–derived CBF values could also be caused by the use of a mean arterial input function–based method for H2[15O]-PET.14 Whereas this method substantially reduces the invasive nature of H2[15O]-PET, it does not measure the individual activity in arterial blood. Indeed, CBF measured with the less invasive technique was shown to overestimate true perfusion by approximately 11%. Because this difference is substantially larger than that between ASL and PET in our study, the underestimation that we found could be considered negligible. This is supported by the lack of a significant difference in CBF or rCBF in territories with qualitatively normal perfusion. Generally, comparisons of quantitative values between different modalities with different quantification models must be interpreted with caution. To minimize bias caused by different quantification models, we normalized the CBF values found in the supratentorial vascular territories to cerebellar CBF (rCBF). In patients with Moyamoya disease, which predominantly affects the anterior circulation, cerebellar perfusion may be assumed to be normal and act as an intraindividual reference for the detection of reduced perfusion. In our study, the mean difference in perfusion values between H2[15O]-PET and ASL was reduced from approximately 13% to a mere 0.7% after cerebellar normalization, leading to a regression slope of 1.0061 (intercept of −0.0057) and allowing for a more meaningful comparison between the 2 modalities. A limitation of our study is the rather small study cohort. However, this is inherent to the low prevalence of this disease. Second, ASL and H2[15O]-PET were not performed in an integrated PET/MR imaging scanner in the same examination or on the same day, but up to 13 days apart. However, there were no interventions or cerebrovascular incidents between the 2 examinations in any of the patients. Because we had no patients with both preoperative and postoperative examinations with both ASL and H2[15O]-PET, we could not evaluate the correlations of ASL and H2[15O]-PET for the assessment of postoperative improvement of perfusion. Our results demonstrate that the assessment of CBF after cerebellar normalization by use of arterial spin-labeling MR imaging correlates well with the H2[15O]-PET reference standard method in children and young adults with Moyamoya disease. Therefore, ASL may prove to be a valuable alternative for preoperative assessment and postoperative follow-up in these patients without the use of ionizing radiation or the need for injection of an exogenous contrast agent. Disclosures: Geoffrey Warnock—OTHER RELATIONSHIPS: Teaching consultant for PMOD Technologies. Alfred Buck—UNRELATED: Royalties: Medrad Inc. Accepted after revision September 25, 2013.